Did you know Repeated use of cloth and water can erode your baby's skin's natural protective layer. That's why Johnson's baby skincare wipes are specially designed using innovative water-saturated fibre which packs 3 times the weight of moisturizing lotion, to keep your baby's skin soft. Each wipe is enriched with moisturizing ingredients that helps protect against redness and rash. Johnson's baby skincare wipes, as mild to the skin as pure water, provide soft and gentle care for delicate new born skin too. Packs 3X weight of moisturizing lotion. Provides soft and gentle care for new-born delicate skin and helps protect against redness and rash. 100% clinically proven to be mild and gentle. Additional Information: A world famous health care and consumer care products brand, Johnson & Johnson aims at bringing innovative ideas, products and services to advance the health and well-being of people. For more than a hundred years, mothers have trusted Johnson's products to provide the purest, gentlest, and mildest care for their babies with their clinically proven baby care products. 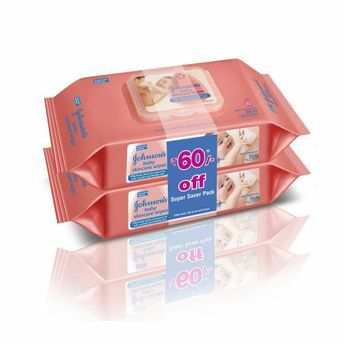 Johnson's Baby Skincare Wipes 80s Pack of 2 super saver pack (Rs 60 off) embodies Johnson's promise to millions of parents across the world a promise of being the best for baby.